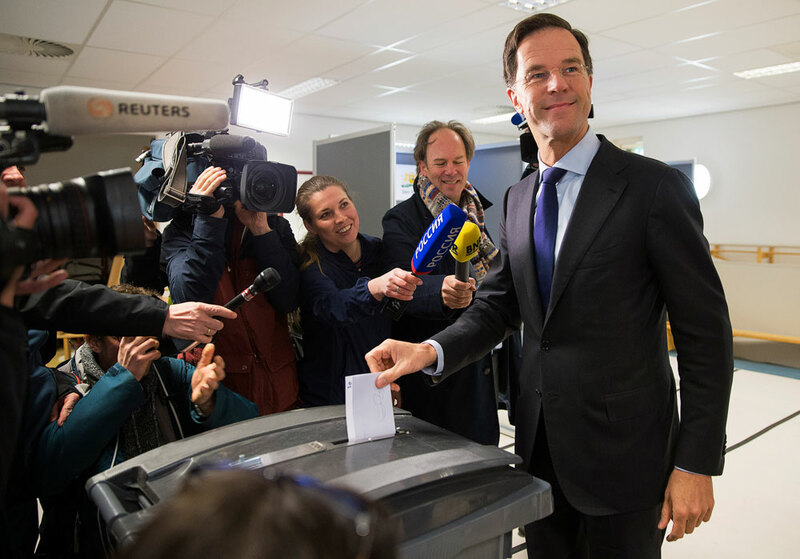 Dutch Prime Minister Mark Rutte casts his vote for the consultative referendum on the association between Ukraine and the European Union, in the Hague, the Netherlands, April 6, 2016. Most Russian media have welcomed the Dutch rejection of an EU association agreement with Ukraine, hoping that the results may not only affect the attitude of Europeans to Ukraine but also to force the EU to "restrain” its ambitions. Dutch voters have rejected the association agreement between Ukraine and the European Union, with two thirds of citizens voting against the agreement in a referendum on April 6. Russian experts say the results may not only affect the attitude to Ukraine but also force the EU to "restrain” its ambitions. Russian Foreign Ministry spokesman Maria Zakharova called the referendum an experiment on the Ukrainian people. "From the point of view of political science and the study of contemporary international relations, [it is] a fantastically interesting moment," Zakharova wrote on her Facebook page. "The only thing that causes sincere regret is that the experiment is being performed on the live and unanesthetized body of the Ukrainian people." Meanwhile, Russian Prime Minister Dmitry Medvedev, commenting on the results of the referendum on Twitter, called them "an indicator of Europeans' attitude to the Ukrainian political system." The Kommersant business daily writes that the Dutch vote was perceived very negatively in Ukraine, and these feelings are understandable, and quotes Ukrainian President Petro Poroshenko, who said that the result was "not an obstacle to Ukraine’s EU-bound path." "The President of Ukraine called the aim of the organizers of the Dutch referendum 'an attack on Europe’s unity' and 'on the spreading of European values,'" reported Kommersant. “I'd like to remind everybody that the true target of those who organized this referendum wasn’t the association agreement between Ukraine and the European Union," said Poroshenko. "It is an attack on European unity, an attack on the spreading of European values. This is also evidenced by the debate that was launched ahead of the referendum." The results of voting in the Netherlands make the ratification of the association agreement between Ukraine and the EU virtually impossible, according to the online newspaper Vzglyad. "This not only calls the European future of Ukraine into question, but in fact marks the beginning of the end of Petro Poroshenko's political career," writes Vzglyad, noting that the results of the vote "disappointed Ukrainians so much that Petro Poroshenko was sharply criticized by deputies from his eponymous party." Ukrainians, of course, did not expect such a turn of events, says the director of the Center for Eurasian Studies, Vladimir Kornilov. However, Kornilov said that if the referendum is declared valid, the "association agreement should be invalidated. So the EU, Ukraine and Russia will be able to perform a reset in relations." Vladimir Bruter, an analyst for the Moscow-based International Institute of Humanitarian and Political Research, is sure that the current situation shows that Europe never actually "turned toward Ukraine." "It was a Maidan fake, nothing more," he said. "Western Europe simply reacted to the situation as it considered advantageous. There should have been no illusions, you should not believe in your own fantasies." Sergei Utkin from the Center for Situational Analysis at the Russian Academy of Sciences, meanwhile, noted that the referendum raises more global questions about the future of the EU as an interstate entity. "Another reason not to seriously raise the issue of EU enlargement in the coming years has appeared," he said. "In general, the European Union should restrain its foreign policy ambitions and concentrate on overcoming domestic problems, of which it has enough."